We’d love your help. Let us know what’s wrong with this preview of The Mammoth Book of Hot Romance by Sonia Florens. 25 unashamedly modern short romances which don't shy away at the bedroom door from romance writers such as Lilith Saintcrow, Louisa Burton, Anna Windsor and Susan Sizemore. This is writing which is more direct, less euphemistic, and frankly accepting of sexuality. 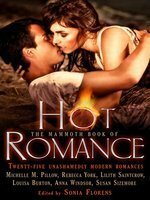 To ask other readers questions about The Mammoth Book of Hot Romance, please sign up. Short stories are difficult to write. They have to be logical, have meaningful characters and plot in a short, short space. Unfortunately, I have yet to find more than a bunch of novel authors who are good at writing short stories too. I could not finish at least a third of the stories, I remember even less than those. They either are part of series I do not know (and can't understand in a short story) or they are a prologue to a series (and you have a wtf moment at the end). But honestly I can' Short stories are difficult to write. They have to be logical, have meaningful characters and plot in a short, short space. There is no common theme to the stories (except being some form of romance, and I use the term loosely). And I guess it doesn't help. I had bought the anthology because of the Lilith Saintcrow' Selene. I expected it to be the story of Selene return to Saint City and how she comes back to Nikolai. Unfortunately, it tells half the story. (Or maybe it just seems too short ...). Several nice reads. Those authors I might even look up later. Jackie Kessler "Hell's Fury" - nice. Adrianne Brennan "Love Under Will" - enjoyable. Selah March "Fly by Night" - pretty good. Justin Elyot "Coming Home" - lovely, for some reason gave me a warm and fuzzy feeling. While I did find a bunch of authors I will be looking up to read later... I found a bunch of them super cheesy with a not so great premise for a short story, some of them would have been better if they were longer and just seemed rushed. DNF. Short story format forces too many flaws in the story development for most authors. This is a collection of ... well really cheesy or weird short stories that I only bought because it included the last chapter of Selene's and Nikolai's story (by Lilith Saintcrow). And even that story was kind of a disappointment... It was well written and fit the characters’ arc, but it was too short and didn't give any emotional closure. Altho, being a story by Lilith Saintcrow, what did I really expect? Oh, well. The only other story that was any good was by Shiloh Walker. It was very much a This is a collection of ... well really cheesy or weird short stories that I only bought because it included the last chapter of Selene's and Nikolai's story (by Lilith Saintcrow). And even that story was kind of a disappointment... It was well written and fit the characters’ arc, but it was too short and didn't give any emotional closure. Altho, being a story by Lilith Saintcrow, what did I really expect? This was an enthralling collection of stories. Some were really good and I really want to read the other stuff by the authors. Others were so so. Not bad as such, but not amazing and not tempting enough to make me go out and buy more by the same authors. However, it is an excellent way to read new writers, to get a sense of their vibe and to see how the genre of hot romance is progressing. Loved it. I enjoyed that I could dip in to the book at a lull in the daily grind. These 25 unashamedly modern short romances don't shy away at the bedroom door, from the creme de la creme of contemporary romance writers, including Lilith Saintcrow, Louisa Burton, Susan Sizemore, and more. Read the stories I wanted to read, not interested in the others. I'm giving this one a 3, souly for the fact that it did not interest me. Hence it kicking around over a month before I was able to finish it. Loved the many short stories! Particularly enjoyed catching up with Selene from Saintcrow's Saint City! A real mix of stories - some about the HEA romance and some more about the hot romance - well actually more about the hot than the romance in some cases. Not really what I was expecting but OK. Liked 1 really well & 12 others were good out of 25 total stories.